alaTest has collected and analyzed 11 reviews of Gigabyte P34W V3. The average rating for this product is 4.1/5, compared to an average rating of 4.1/5 for other products in the same category for all reviews. People are impressed by the usability and durability. The design and portability are also mentioned favorably, but some have doubts about the image quality and energy efficiency. We analyzed user and expert ratings, product age and more factors. Compared to other products in the same category the Gigabyte P34W V3 is awarded an overall alaScore™ of 87/100 = Very good quality. The refreshed ultra portable 14" P34W v3 gaming laptop has a great specification, but ultimately fails with heat and noise issues. 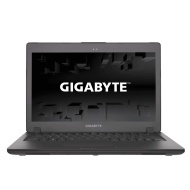 While Gigabyte's new 14-inch P34Wv3 looks like a simple Ultrabook, inside you'll find an Nvidia GeForce GTX 970M and a fourth generation Intel Core i7 CPU. This gaming ultra-portable can stand toe-to-toe with many 17-inch gaming rigs. With a well built tasteful design and an impressive array of specs the P34Wv3 feels like the perfect marriage of portability and performance. The only thing marring the overall package is its thermal issues.